Indian-origin actor Aziz Ansari has won the Best Actor award in the 75th Golden Globe Award for Television Series - Musical Comedy category for 'Master of Nun'. Ansari, who accepted the award in the 75th awards ceremony on Sunday night, said, "I did not really think that I would win, because all the websites were saying that I would lose. I am happy to win an award because the disappointment after losing two consecutive terms is disappointing. Ansari also thanked the Hollywood press with his parents. Actress Nicole Kidman was given the Best Actress Award for her performance in 'Big Little Lights'. On this occasion, Kidman talked about the ongoing sexual assault issue in Hollywood, saying that it is necessary to say the true stories. Elizabeth Moss also won the award for 'The Handmade's Tale'. Sieros Ron got the award for Best Actress in a Musical / Comedy category. Brown is the first African American to win the TV drama award. Famous celebrity Oprah Winfrey said that it was a great experience for the first time in 1964 that Sidney Piotr received Best Actor Award. It was not believed that a black person was given this honor. Today many girls will be watching me. Because I am the first black woman to get this award. This is a chance to share the award with all the men and women, who inspired me. Who has challenged me. Indian Space Research Organization (ISRO) will soon launch the country's heaviest communication satellite GSAT-11. It weighs 5.6 tons. We do not have a rocket capable of sending more than four tons of weighty satellites, so this will be launched by the Arian-5 rocket from the French Guiana of South American Island. High internet speed: In this club we get better internet speed. Internet connectivity will be cheaper. Will reach the whole country. Cyber Security: Get a new security shield. Cyber security will be strengthened. The system-banking system will be strengthened. Space X 800 will launch the satellite. The internet will provide the whole world. 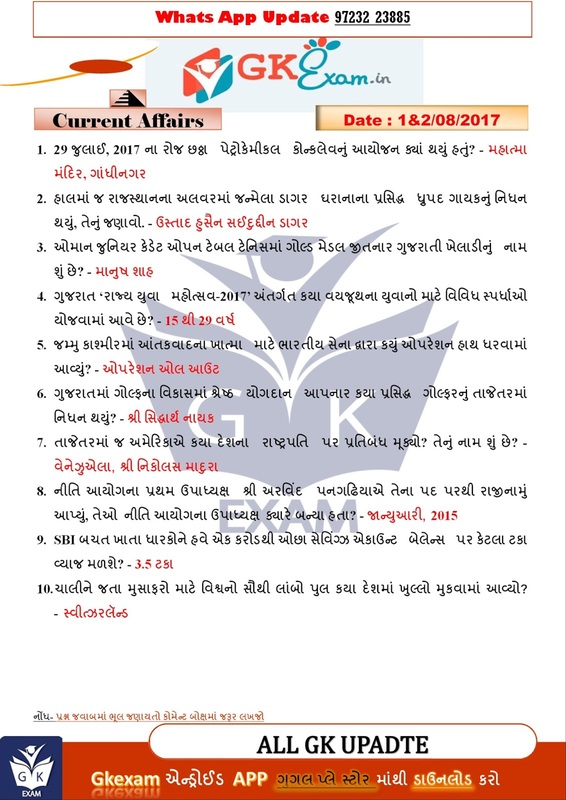 Gujarat Rojgar Samachar E- paper: Gujarat Information Department has published Gujarat Rojgar Samachar of the Date: 13-10-2017. 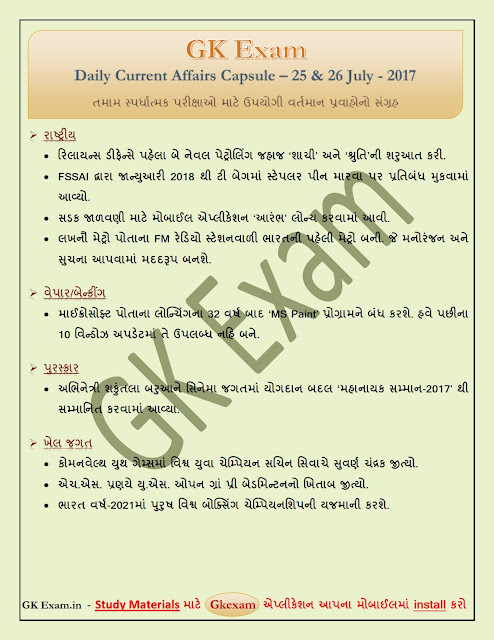 Download Gujarat Rojgar Samachar for Govt jobs of Gujarat.you can download Gujarat Rojgar Samachar E- paper of date 11-10-2017 from Govt Website www.gujaratinformation.net or from below link. 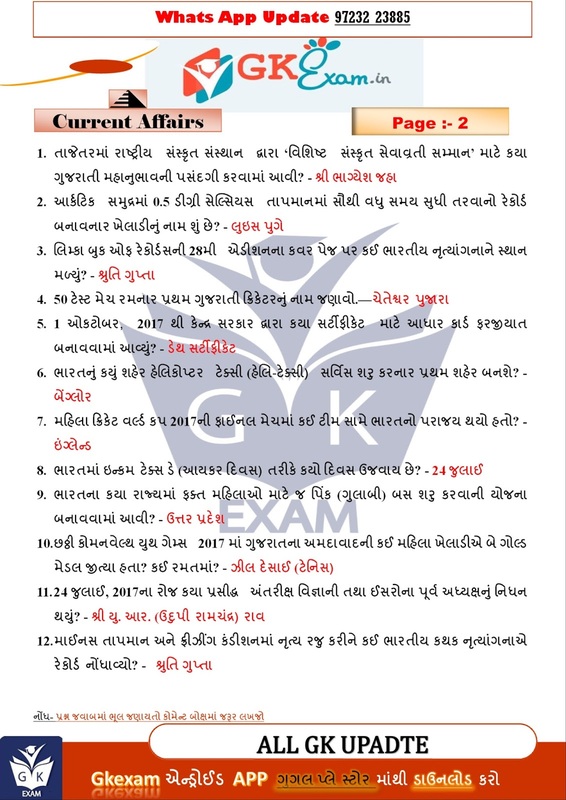 Current Affairs (In Gujarati) for all competitive exams : Page : 2 by GK Exam. Current Affairs (In Gujarati) for all competitive exams : Date - 25 & 26 July - 2017 by GK Exam. Ram Nath Kovind Earlier Life & Family Ramnath was born on 1 October 1945 in Village Paraunkh, Derapur, Kanpur, Uttar Pradesh, India. His parents Maiku Lal (Father) is a farmer and Kalawati (Mother) house wife. Ram Nath belongs to Dalit caste. He is the president of BJP Dalit Morcha (1998-2002). Complete his graduation in law from a Kanpur college. Kovind was an Advocate by professional before entering into politics. He married to Savita Kovind in 1971. After graduating in law from a Kanpur college, Kovind had gone to Delhi to prepare for the civil services examination. Ram Nath Kovind passed this exam on his third attempt. But he did not join as he was selected for an allied service instead of IAS and thus started practicing the law. Central Government Advocate in Delhi High Court from 1977 to 1979 and served as a Central Government standing counsel in the Supreme Court from 1980 to 1993. In 1978, he became an advocate-on-record of the Supreme Court of India in 1978. He practiced in the Delhi High Court and Supreme Court for about 16 years till 1993. He was also enrolled as an advocate in 1971 with the bar council of Delhi. As an advocate he provided free legal aid to weaker sections of society, women and the poor under the Free Legal Aid Society in New Delhi.He also served as the personal assistant of the then Prime Minister of India Morarji Desai between 1977-1978. Ram Nath Kovind joined the BJP in 1991 after serving 16 years as a lawyer. He has served as the President of the BJP Dalit Morcha between 1998 and 2002 and President of the All-India Koli Samaj. He also served as national spokesperson of the party. He donated his ancestral home in Derapur to the RSS.He was fielded as a candidate from Ghatampur and Bhognipur assembly constituencies but lost both elections. Ram Nath Kovind was elected and became as Rajya Sabha MP from the state of Uttar Pradesh in April 1994. He served a total of twelve years, two consecutive terms till March 2006. As a member of parliament he served on the Parliamentary Committee for Welfare of Scheduled Castes/Tribes, Home Affairs., Petroleum and Natural Gas, Social Justice and Empowerment, Law and Justice. He also served as the chairman of the Rajya Sabha House Committee. During his career as a parliamentarian, under M.P. L.A.D. Scheme, he focused on the education in rural areas by helping in construction of school buildings in Uttar Pradesh and Uttrakhand. As a MP, he visited Thailand. Nepal, Pakistan, Singapore, Germany, Switzerland, France, United Kingdom and USA on study tours. Daily General Knowledge Corner is published By Mr. Jarjis A Kazi. It is Very famous as Lok Sansar GK Page. In this General Knowledge Page you will find General Knowledge Questions And Answers . These all Gk Questions Will help you for Competitive exams Like GPSC,HTAT,TET,Police Constable, Bin Sachivalay Clerk, Revenue Talati and many more. 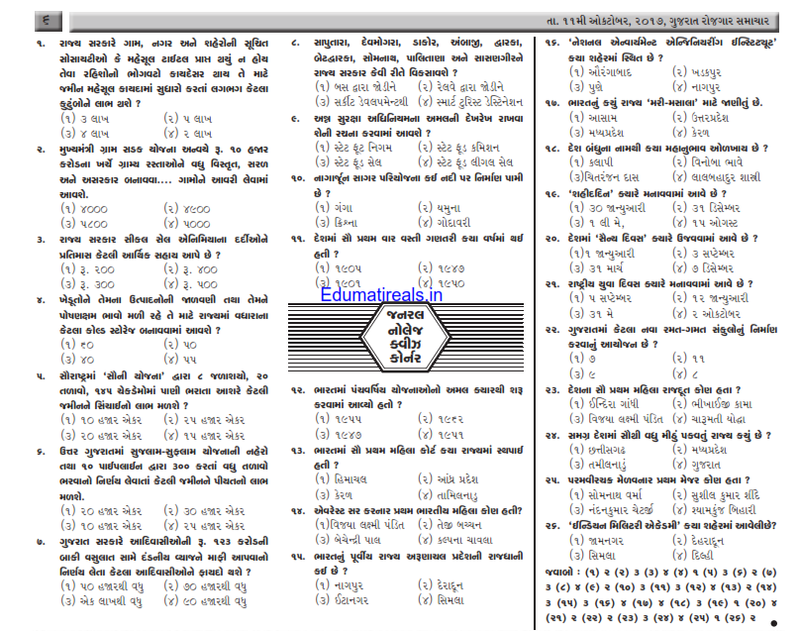 Hare Is very important General Knowledge question and answers for Any Gujarat level competitive exams. Thanks To Jarjis Kazi Sir for providing such a very good material. You Can also visit his official blog jarjiskazisir.blogspot.in for more material. To view this Gk Page clearly click on image. 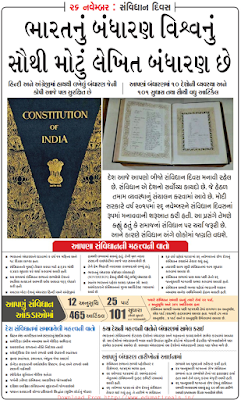 The Constitution of India is the supreme law of India. It lays down the framework defining fundamental political principles, establishes the structure, procedures, powers and duties of government institutions and sets out fundamental rights, directive principles and the duties of citizens. It is the longest written constitution of any sovereign country in the world. The nation is governed by it. B. R. Ambedkar is regarded as its chief architect. Jawaharlal Nehru signing the Constitution It imparts constitutional supremacy and not parliamentary supremacy, as it is not created by the Parliament but, by a constituent assembly, and adopted by its people, with a declaration in its preamble. Parliament cannot override the constitution. It was adopted by the Constituent Assembly on 26 November 1949, and came into effect on 26 January 1950. With its adoption, the Union of India became the modern and contemporary Republic of India replacing the Government of India Act, 1935 as the country's fundamental governing document. To ensure constitutional autocracy, the framers of the constitution repealed the prior Acts of the British Parliament via Article 395 of the constitution.India celebrates its coming into force on 26 January each year, as Republic Day. It declares India a sovereign, socialist, secular, democratic republic, assuring its citizens of justice, equality, and liberty, and endeavors to promote fraternity among them. It was drafted by the Constituent Assembly, which was elected by elected members of the provincial assemblies. The 389 member Constituent Assembly took almost three years (two years, eleven months and eighteen days to be precise) to complete its historic task of drafting the Constitution for independent India, during which, it held eleven sessions over 165 days. Of these, 114 days were spent on the consideration of the draft Constitution. On 29 August 1947, the Constituent Assembly set up a Drafting Committee under the Chairmanship of Dr. B.R. Ambedkar to prepare a draft Constitution for India. While deliberating upon the draft Constitution, the assembly moved, discussed and disposed of as many as 2,473 amendments out of a total of 7,635 tabled. Dr B.R. Ambedkar, Sanjay Phakey, Jawaharlal Nehru, C. Rajagopalachari, Rajendra Prasad, Sardar Vallabhbhai Patel, Kanaiyalal Munshi, Ganesh Vasudev Mavalankar, Sandipkumar Patel, Maulana Abul Kalam Azad, Shyama Prasad Mukherjee, Nalini Ranjan Ghosh, and Balwantrai Mehta were some important figures in the assembly. There were more than 30 members of the scheduled classes. Frank Anthony represented the Anglo-Indian community, and the Parsis were represented by H. P. Modi. The Chairman of the Minorities Committee was Harendra Coomar Mookerjee, a distinguished Christian who represented all Christians other than Anglo-Indians. Ari Bahadur Gurung represented the Gorkha Community. Prominent jurists like Alladi Krishnaswamy Iyer, Benegal Narsing Rau and K. M. Munshi, Ganesh Mavlankar were also members of the Assembly. Sarojini Naidu, Hansa Mehta, Durgabai Deshmukh, Rajkumari Amrit Kaur and Vijayalakshmi Pandit were important women members.